Even though I only live an hour west of Washington D.C., I really don’t take advantage of my proximity to the Nation’s Capital. But last summer I spent a lovely August evening walking around the Mall and photographing some of the monuments. Our last stop was the National World War II Memorial, where I was able to set up the tripod for some long exposures that captured the fountains with a reflection of the Washington Monument. Shooting the Nation’s Capital at night seemed like a proper post for this week’s A-Z Archive Challenge that featured the letter “N,” and returning to this gallery reminded me that I need to once again plan a photographic outing to D.C. Wonderful dark blue evening sky contrasted against the lights and the monument! Thank you, John! It was just after the sun had fully set and was blue for just a short time. 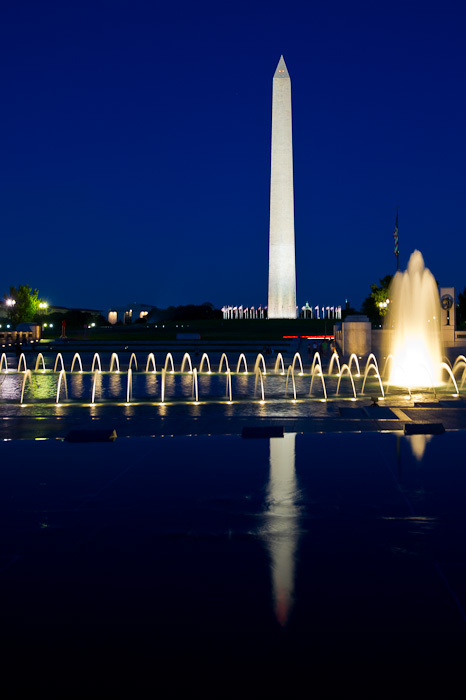 … the National World War II Memorial, where you busy set up the tripod for some long exposures that captured the fountains with a reflection of the Washington Monument: thank you for this Tricia! For sure only possible with a tripod! The tall Obelisk – is that WW II memorial? The tall obelisk is the Washington Monument, which is across the street…I’m standing with my back to the Reflecting Pool and the Lincoln Memorial to give you some perspective. The White House would be to my left. Great photo Tricia! Funny how we forget about the places that are nearby. Yes, we do. The cherry blossoms bloomed early this year, so I didn’t have time to see them. But I hope to get back to D.C. in the next few weeks when the spring flowers are still out and before it gets too hot! maybe you like now to join the letter “O”! challenge?